A British doctor, Carpenter, arrives at the dock in Scotland where a nuclear submarine, the USS Dolphin, is preparing to sail. He has orders from the US Fleet commander that he is to be conveyed to Ice Station Zebra, a British research base in the Arctic. The station has sent an SOS: an accident has left many of the scientists dead or injured. Without food or heat the survivors will die within days. Dolphin can travel under the icecap, look for a patch of ice near the base thin enough to break through and rescue the scientists. Dolphin travels to the Arctic and breaks through the ice, first a hundred miles from the base, and second only five miles away. Carpenter and four of the submarine’s crew walk through the blizzard to the base. When they arrive at Ice Station Zebra it has been destroyed by fire. There are eleven injured survivors in one hut. Carpenter returns to Dolphin, and tells the Captain there’s thin ice near the base. Dolphin prepares to blow a hole in the ice with a torpedo, but, someone has sabotaged the torpedo tube doors and seawater pours in. The submarine plummets into the ocean depths. The Captain manages to halt the dive by pumping air into the fresh water and diesel tanks. Dolphin breaks through the ice and rescues the scientists. Carpenter inspects the base. He discovers the fire was deliberate, and that three of the men were murdered before it started. He explains to the Captain that Soviet agents had infiltrated the base because it had clandestine missile warning equipment. They must be responsible for the murders and the fire and are likely to be amongst the survivors. Dolphin [blackout]sets off under the ice, back to Britain but during the night the engine room is set on fire and the submarine fills with smoke. The crew start running out of oxygen but finally manage to stop the fire and restart the engines. Carpenter[blackout] gets the scientists together and reveals he is an MI6 agent and knows who the murderer is. 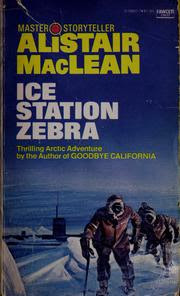 The reason for the murders and the sabotage was that vital spy satellite film had landed near Ice Station Zebra. The Soviet agents were ordered to retrieve the film and killed the three scientists when they became suspicious. They sabotaged Dolphin to try and give the Soviets time to retrieve them and the film. Carpenter tricks the Soviet agents into confessing and then arrests them.